It is so large, that even though it's part of Europe, it's also part of Asia! For dessert in Russia, you might have syrniki, which is kind of like a donut! Saint Basil's Cathedral is a beautiful famous church in the city of Moscow. One of the most famous musical composers ever was Russian Pyotr Ilyich Tchaikovsky. He wrote the famous Nutcracker ballet. Let's keep learning about the four Gospels in the New Testament. We've already learneda bout Matthew, Mark and Luke. The last of the four gospels is John. John was the cousin of Jesus, and one of the Apostles. For God so loved the world, that he gave his one and only Son, that whoever believes in him should not perish, but have eternal life. spinning around our star which is called the Sun. We use the word solar just for our Sun, not for other stars. we use the name planetary system. We just learned how to count to 99 in French! Wow! What about numbers 100 and over? For numbers higher than that, you just say the individual numbers afterward. Lava is molten (or melted) rock! To melt rock, the temperature has to be over 1,200 degrees. 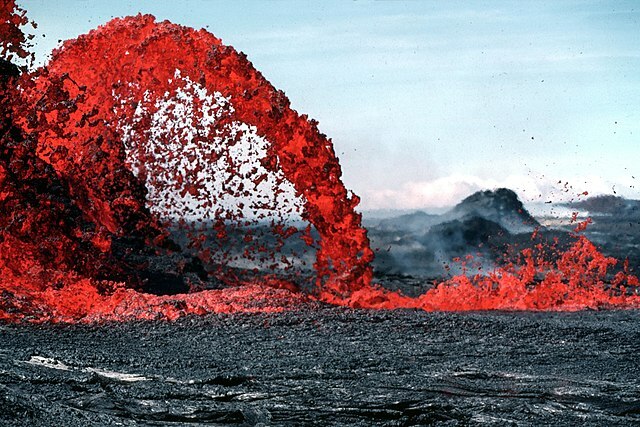 The word lava is also used for the cooled down lava that turns into rock. 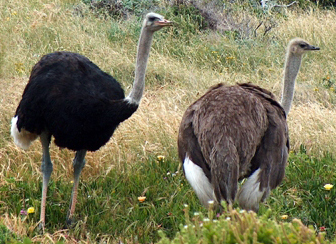 The Ostrich is the largest bird in the world. and about twice as fast as a human, at 43 miles per hour! about 10 times bigger than a chicken's egg. so that from far away it just looks like a large pile bush instead of a big bird! Let's keep learning about the muscles in the human body! Last time we learned about how the Forearm flexors are used to help flex your elbow together. Even though the forearm muscles are smaller than biceps, there are a few other important muscles there too. or when you open up your hand and spread out your fingers. Let's keep learning about the countries in Europe! Last time we learned about Belgium. Iceland is an Island out in the Atlantic Ocean, between Europe and North America. For dinner in Iceland, you might have liver sausage called Lifrarpylsa. A geyser is a hole in the ground that shoots water up in the air. 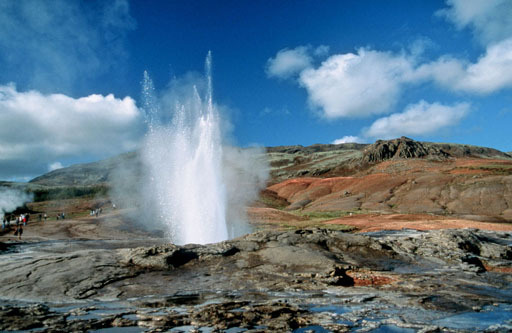 One of the oldest geysers in the world is in Iceland, called Geysir. There are over 200 volcanos in Iceland! Huldufólk is an Icelandic word that means "hidden people". Long ago people believed that there were little elves living in Iceland, and people would even build tiny houses for them! We've already learned about Matthew and Mark, next up is Luke. The book of Luke has 20 miracles, 16 of which also appear in some of the other 3 gospels. It also tells of the angel Gabriel bringing the good news to Mary that she was going to have baby Jesus. History tells us that Luke was a doctor, an artist and a historian. An interstellar cloud is a big bunch of gas, plasma and dust floating together in space. We just learned how to count to 89 in French, let's keep going! Just like seventy was really sixty-ten and eighty was four-twenties, ninety is also a little different. The word for ninety is quatre-vingt dix which means four-twenties ten because 20 times 4 is 80, plus 10 is 90! We've now learned about diodes, photons and electroluminescence. Now let's learn about something called LEDs. LED stands for light emitting diode. Remember that a diode is a special thing you run electricity through. which are tiny little light particles. which means it gives off light when electricity goes through it. LEDs can be made in just about every color, and unlike a light bulb they won't burn out! The kiwi bird is a small bird that lives in a country called New Zealand. It can't fly, just like the ostrich or penguin. is about six times the size of a chicken's egg! One different thing about the kiwi is that it has nostrils at the very end of its beak. It can use it's beak to smell the dirt and find small bugs or seeds to eat below the dirt. In your forearm there are a few different muscles. it is called the brachioradialis. Last time we learned about Austria. Belgium is a country just North of France, and West of Germany. For breakfast in Belgium, you might have a Belgian waffle! The saxophone was invented by Belgian musician Adolphe Sax. Hundreds of years ago, people would visit the town of Spa in Belgium, to relax in cool water springs. Last time we learned about Matthew, next up is Mark. Mark was another follower of Jesus who also told of the miracles he performed. 22 miracles are listed in the Gospel of Mark, and 19 of them are the same ones listed in Matthew. and after it burns for another 1 billion years it will turn into a White Dwarf. then it will cool down and turn into a Black Dwarf. That's such a long time, that no actual black dwarfs exist! Scientists are just pretty sure that's what is going to happen some day. We just learned how to count to 79 in French, let's keep going! Just like seventy was really sixty-ten, eighty is also a little different. The word for eighty is quatre-vingts which means four-twenties because 20 times 4 is 80! when you run electricity through them. which we learned before are just two kinds of chemicals mixed together. go shooting off of the chemicals and make it glow. Hedgehogs look kind of like tiny little porcupines. And just like porcupines, they have poky hairs on their back (called spines) made of keratin. Their spines don't come out like a porcupine's quills, they are just sharp. Hedgehogs also do a funny thing called anointing. they will lick and bite that thing, and then spit on their spines. but some think it is so they can hide their smell from other animals that want to eat them! but most people just call it your calf muscle. You are using your calf muscle when you move your ankle. Last time we learned about Romania. Austria is a country just East of Italy, and South of Germany. 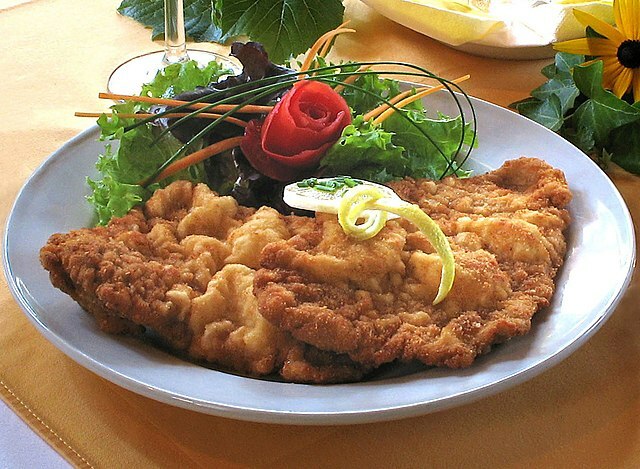 which is a flat piece of meat covered in breading. most famous musical composers to ever live. and a movie called The Sound of Music was based on their life. The first books of the New Testament are the four Gospels. all tell about Jesus and the miracles he performed. The first gospel is the book of Matthew. In the book of Matthew, he tells of 23 different miracles that Jesus performed. and fed thousands of people from just a basket of bread and fish. He tells of the story of Jesus birth, tells of the wise men visiting baby Jesus. He also tells of Jesus dying on the cross, and being resurrected three days later. Matthew started off as a tax collector, but became one of Jesus followers. and that after it burns for 10 billion years it will turn into a Red Giant. A White Dwarf is much smaller than a Red Giant or Yellow Dwarf, but very thick. The big star Sirius A has a very small neighbor Sirius B that is a white dwarf. So we can call it an A1V star, or a white dwarf. that is the small white dwarf Sirius B. We just learned how to count to 69 in French, let's keep going! you just use the word for sixty (soixante) add ten (dix) and you get soixante-dix! Seventy one is sixty-eleven, and so on. When you turn on a light bulb or use your flashlight, it makes things brighter. But does light actually have parts? Is it made up of little bits, or is it just light? It turns out light is actually made up of something called photons. but they do move around and they are tiny little particles! but don't try to pet it unless you want to get poked! Porcupines have quills, which look like long sharp needles that stick out from their backs. a turtle's shell, and rhino's horn. The quills have little barbs on them, that are like small needles pointing the opposite way. So when you get a porcupine quill stuck in you, it's really hard to get it out. This helps the porcupine protect itself. What happens when a porcupine pokes itself? so even if it falls out of a tree and pokes itself with a quill, it will heal up fast! Next up is the quadriceps. 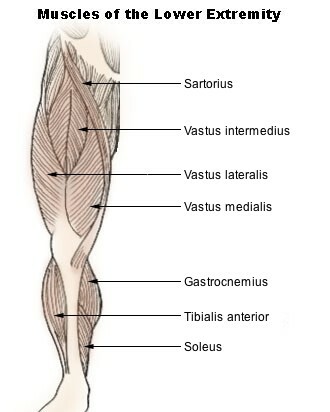 These are the muscles on your thigh, sometimes just called quads. You use your quads when you move your upper leg around, or when you bend your knee. Romania is located just south of the Ukraine. For dinner in Romania you might have a plate of sărmăluţe cu mămăligă, which is stuffed cabbage rolls, with sauerkraut and porridge. but there was a real person person named Dracula (he just wasn't really a vampire). He was a prince in a part of Romania called Transylvania. There is even a castle there that he used to live in, called Bran Castle. There is a wild and crazy winding road in the mountains called the Transfăgărășan.